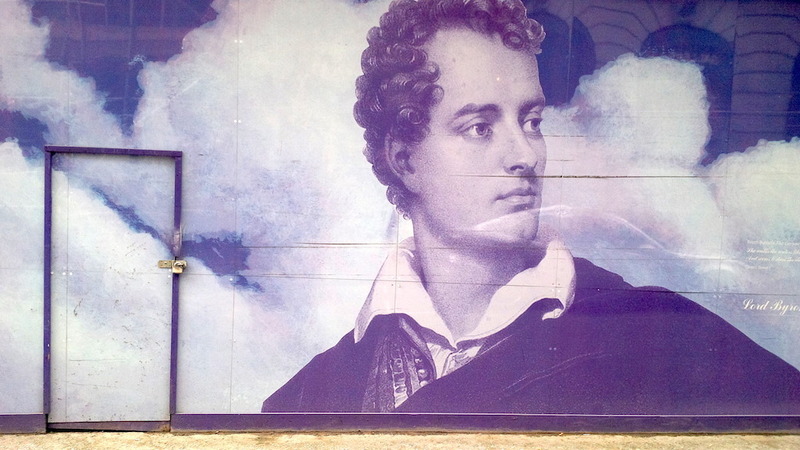 Byron on the hoarding at 55 St James Street. Earlier today I was crossing St James Street on my way to the London Library when I came upon Lord Byron. He had been pressed into service to decorate a hoarding behind which 55 St James Street is being re-developed. A helpful notice on the hoarding explained that 'St James Street came into existence soon after King Henry VIII's acquisition of St James Hospital on whose site he built St James Palace. After 1662 the street became famous for its coffee houses and chocolate houses which led to the establishment of aristocratic clubs such as White's, Brooks' and Boodle's. Regency leader of fashion Beau Brummel held court at White's displaying his taste and style to all passersby. The clubs spawned businesses supplying their gentlemen members with necessities such as perfume, shaving brushes, razors, wine hats, boots and clothing'. And so it remains true in this area today. But why Byron? It did not say. In fact Byron lived at 8 St James Street in October 1811 soon after his return from the East. He had been visiting Ali Pasha in Ioannina in what is now northern Greece where he started Childe Harold’s Pilgrimage. Now on his return he walked up St James Street and directly across Piccadilly into Albemarle Street, the home and premises of John Murray. The following March Murray published cantos I and II of Childe Harold’s Pilgrimage which caused a sensation and made Byron famous overnight. Girls and young women crowded about Murray's door squealing in hopes of seeing their romantic hero. John Murray would have quite enough of that over the years to come. On one of my visits to John Murray's I was ushered into a room where I sat down on an embroidered cushion. No, no, you must not sit there, came an anguished cry, and I was quickly planted elsewhere. Within the embroidered cover was the pillow on which Byron died at Missolonghi. But worse things had happened, I was told, and at the hands of John Murray himself. Not the original John Murray but a later John Murray. In every generation for two hundred years the family business was run by a John Murray. The catastrophe was done by a Victorian John Murray. It seems he discovered that Byron on his travels and pilgrimages had been sending clippings of the pubic hairs of his ladies to the first John Murray who dutifully filed them away. But then along came Victorian Murray who threw them into the fireplace. This story of incalculable loss was told me to lighten the mood lest I had felt unduly chastised for sitting on Byron's death pillow. To get back to 55 St James Street, I suppose Byron is there on the hoarding to raise the tone of the development. And I did enjoy seeing Byron larger than life. 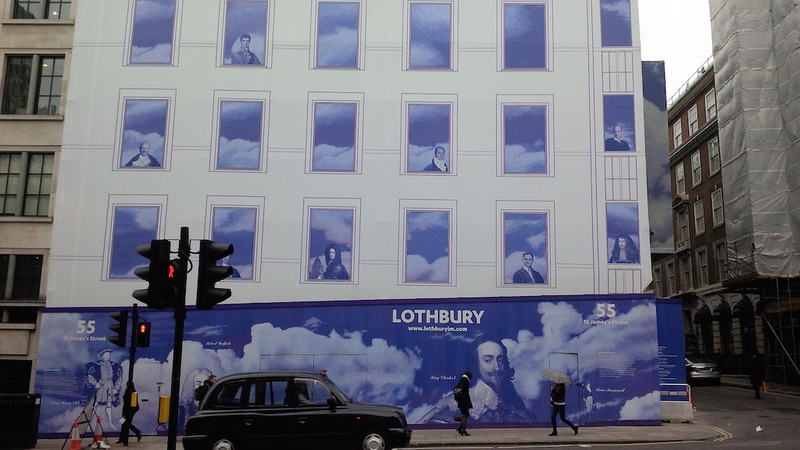 Whenever again I look at 55 St James Street I will think of those lost pubic hairs. 55 St James Street, London. 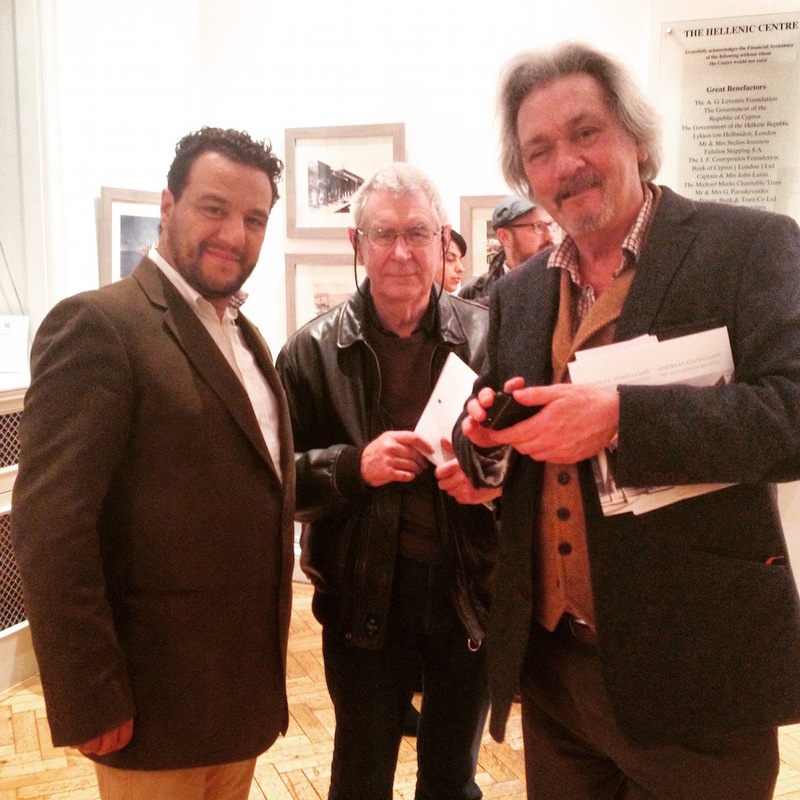 Last night I went to the Hellenic Centre in London to see the exhibition of Alexandria Quartet illustrations and to meet the artist himself, Andreas Georgiadis. I was glad to have the chance to see the illustrations close up. They are drawn in ink on cotton paper and are wonderfully subtle and detailed. Andreas is highly knowledgable about the city, the cosmopolitan Alexandria of the nineteenth and twentieth centuries, and takes pride in the contribution made by Greeks to reviving Alexandria - even as he now records in his drawings what is being neglected and destroyed. Andreas Georgiadis, Frank Pike and Michael Haag at the Hellenic Centre. One good piece of news I picked up from Andreas is that Constantine Cavafy's flat looks like being saved for posterity by the energy of the Greek consulate in Alexandria. For many years the flat had been a broken down pension; then the Greek consulate leased the flat from the owner of the building and turned it into a museum. But the fear has always been that one day the building would be torn down, like so much else of cultural value in Alexandria is being torn down, not least the Ambron Villa where Lawrence Durrell lived during the Second World War. Andreas tells me, however, that the Greek government, acting through the consulate, will buy the entire building, safeguarding the future of the flat-turned-museum, preserving something of the atmosphere of the past and commemorating one of the greatest poets of modern times. With me at the exhibition was Frank Pike. Frank began his career at Faber and Faber as copy editor on the last volumes of Lawrence Durrell's The Alexandria Quartet. Later Frank became Durrell's full-blown editor and worked on The Avignon Quintet and Durrell's last book, Caesar's Vast Ghost, his ruminations on Provence. Andreas has so far exhibited this collection of drawings in Athens, Cairo, Alexandria and now London. Next he hopes to take it to Corfu. I suggested he arrange to present the exhibition at the White House at Kalami where Lawrence Durrell lived in the late 1930s and where he wrote The Black Book; those same years that were later to be the material for his beautiful book about Corfu, Prospero's Cell, written in the tower of the Villa Ambron in Alexandria. The White House is owned by Tassos Athinaios, grandson of the man who originally let the house to Durrell and his wife Nancy. An exhibition there would be a homecoming of a sort.